Home » ConveyIQ » Where is Your Applicant Pipeline Breaking Down? The battle for talent today requires an impeccable hiring process. A single wrong move along the path can turn a potential hire into a loss. With jobs so plentiful and candidates so meager, conversion has never been more critical. Streamlined application processes, constant communication, a marketing mentality and more are needed for a candidate experience that nets new hires. If there’s a break in the pipeline at any point, the entire process has to start anew. Many companies are experiencing the ghosting phenomenon from job seekers. Phone calls are never returned; interviews scheduled turn into no-shows; even start dates are ignored. In some industries, the no-show rate for interviews is 70%. Some believe it’s sweet revenge: employers have been ghosting candidates for decades, leaving them hanging indefinitely waiting for a response. Some suggest younger candidates simply don’t have the confidence to say no. There may be another reason candidates ghost employers and vanish into thin air: a fault in the hiring process. If you’re losing candidates along the hiring pipeline, it’s critical to examine every touch point along the way to find out where and why. It starts with a thorough walk through of every step along the way to see what can be removed and what can be improved. Your career site sets the tone for working at your company. Does it boost your brand or just look bland? The messages your job site sends with images, ease of use and technology translates to job seekers know they’re applying to a dynamic, diverse workplace or a dinosaur. How challenging is it to apply? Recent data shows 60% of candidates will abandon an application process that is too lengthy or complex. Many will not apply at all if your process isn’t optimized for mobile applications. The process should be easy, welcoming and fast. Many companies are ditching the blind “apply to hr@xyz.co” for an actual person’s email address, and candidates like that. Identifying a real person who will be the applicant’s point of contact throughout the process shows transparency and pride. 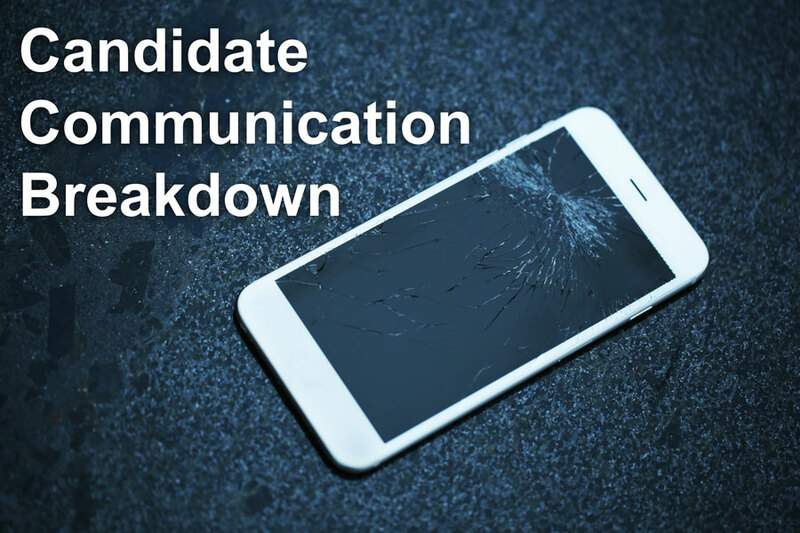 You can lose a candidate quickly if you don’t respond immediately with a phone interview, and if appropriate, set an interview time. A recent study showed 47% of applicants feel business does a good job setting communication expectations at the start of the hiring process: but 78% of employers believe they do so. Are you setting a timeline for the process and sticking with it? Communicate at each step along the way: constant communication tells the job seeker they’re valued and you’re highly interested. Are you in constant communication with an applicant: touching base to let them know the team is finalizing first interviews, reviewing all the applicants, prepping for a round of second interviews, etc.? If you want them to be a part of your team, treat them like they already are one – keep them in the loop and speak to them like a colleague. If you can connect with them as a candidate, they can more easily see themselves as a coworker. At every touch point along the process are you boosting your brand or letting the applicant make reach their own conclusions? You’ll love meeting with the team – they’re so innovative is more enticing than be here at 3 for the first round of interviews. Consider how you’re presenting your brand: is it a draw or a yawn? The longer they’re a free agent, the more chances they’ll be picked up by another team. Reducing time to hire is mission-critical in today’s market. The average time from application to job offer is less than 24 days, but in some industries, like food and retail, offers on the spot are the norm. While it’s never a good idea to skip processes like reference checks, the faster you can make an offer, the better. As much as you may want to speed time to hire, some steps simply can’t be skipped. In the meantime, are there events or company offerings you can show the candidate? An offer to take a tour of your L&D offerings or a chat with their team might inspire the job seeker who’s looking to grow on the job. Could you have them as a guest at company events - big meetings or at volunteer outings? A chat with your Benefits Administrator could show them what you have to offer. Are you using the lag time before you make an offer or a new hire starts on the job is an opportunity to boost your brand? If you aren’t you should. Finally, there will be instances when you lose a candidate to the completion. But if you’ve made a connection with the candidate, they’re more likely to tell you why. In some instances, you may be able to counter the better offer they’ve received and salvage the hire. It starts with a flawless applicant pipeline and ends with an outstanding new hire. To learn more about building a flawless applicant pipeline, download our free white paper on candidate communication here.